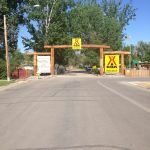 Ask fellow campers about "Greybull KOA" and nearby attractions. This is a great little KOA. We stayed for 3 nights. Many people just came and went in 1 night but we found 2 scenic drives in the area that made it worth the extra nights for us. It is clean, well maintained and managed. The owner/managers are very welcoming and helpful with info about the area. We were in site #12 and had asked to get a site open to the SE for our satellite and it was perfect. They even said they would keep the site next to us (14) open so no one would be parking there to block our signal. The restrooms and showers were very nice and clean. They have 4 washers and driers in their laundry room which were also well taken care of. The only negatives are the type of gravel in the park. Because it is all large gravel rocks with little or no "fines" it doesn't break down so it is noisy when people walk or drive on it. This was probably used so it wouldn't have to be replaced as often. One other thing is that the entry and exit are just a little tricky just because it is a small park they had to be creative - but it works. Those are the only reasons we didn't rate a 10 Their cable TV is very good - they give you a remote and you put your TV on channel 3 and you get a lot of channels. All the utilities work well and the concrete pads are very level. We would definitely stay here again. We camped at Greybull KOA in a Travel Trailer. I believe most RV sites are level, cement, FHU with cable TV and Wi-Fi. Some are pull through while others are back or pull in. There are a handful of W&E only sites. 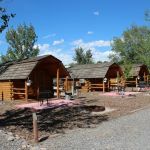 The park also has 6 long term RV sites, 6 cabins, and 7 tent sites. There is a pool and a playground. The "office" building also contains a laundry, bathrooms, and store. We camped at Greybull KOA in a Motorhome. Very nice and helpful owner that bought park two years ago. He helped us fix a TV problem, which was above and beyond what was expected. We were on front row in a pull thru. Full sun until dark, which made it very hot. Had a concrete pad with a nice cool-deck patio with table and chairs. Laundry room was clean. 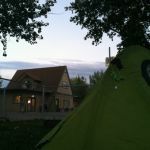 We camped at Greybull KOA in a Travel Trailer. We pull a 43 ft fifth wheel with an F350. Entry into the park was easy. Park is located at the end of a short residential street. Park is very quiet. Staff were wonderful. We are here at the end of Sept so park is very empty. Lanes within the park are wide. We had a premium site which is long and paved with a concrete patio, patio furniture, inground fire pit and grill. Some sites also have nice double swings. Each site has tall trees on each side for nice shade. Wide areas on each side of the site are covered with wood chips. Nice and clean. Utilities are well positioned and in good working order. AT&T Cell and Verizon Broadband both work well. WIFI seems to be good (keep in mind park is empty) You can choose high speed Internet for an additional daily charge. 60 cable channels. Plus satellite works well. There is a really nice fenced in dog park. Propane in sold in the park. There is a pool but it is closed for the winter. There is a really nice child's playground. We experienced no bugs. We would definitely return to this park. We camped at Greybull KOA in a Fifth Wheel. We stopped here in early July as we headed west at the beginning of this trip. We expected to stop here again on our way back east but did not. See my 8/16 review for a more detailed description of the park. As usual, we had a FHU, pull through site with cable and the free Wi-Fi that was adequate for our minimal (e-mail and web surfing) needs. The bathrooms, showers, and laundry were clean and adequate for this size park. They have food service and a variety of recycling bins. We always enjoy the pool and there is play equipment for the kids. As always, the owners were friendly and helpful. Unfortunately, due to age and health reasons, they are still looking to sell the park. While I hope they succeed, I will miss them. Over the course of 27+ years of RVing at over 1,000 different RV parks, this is probably our favorite. We camped at Greybull KOA in a Motorhome. We have been RVing for 5 years now and this is the first KOA we have ever stayed at. I guess we picked a good one from all the positive reviews. The owners were above and beyond friendly and helpful. Upon walking in the office door, the gentlemen went right to the fridge and handed us each a bottle of cold water and a KOA cup. Much appreciated, as it was above 90 degrees. Just like others have said, clean grounds, nice clean pool, clean restrooms and showers. 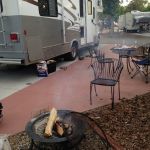 Our site was large enough for our 31 ft RV and Jeep with room to spare on a cement pad with patio furniture. There was a chain across the front of the site giving us easy access to the street in what seemed like a quiet neighborhood. The chain was easily removable for exiting but also someone from street side could enter. This was not a worrisome for us, we felt safe. We only stayed one night traveling home but would have stayed longer if we needed to rest. We camped at Greybull KOA in a Motorhome. This is the nicest KOA we have ever stayed in! The host/owners are marvelous! Full service, work perfectly, and the pool is now open. Sites are level. Our pup enjoyed the dog park. WiFi is great as is cable. They have a great brochure about the great things to do here. Perfect in every way! We camped at Greybull KOA in a Travel Trailer. Sightseeing, Hiking, fishing, museums, jeep trails, bike rides, waterfalls, archeology, Day trip planned to see wild horses, moose, elk, etc! 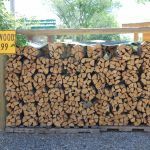 This KOA is mid distance between Custer State Park and Yellowstone NP. Perfect midway stop over for a few days! Well managed park with hands-on owners and paying attention to detail. Very, very clean. Bathrooms exceptionally clean. Dog park is on the smaller side but did the job. I walked the dogs in the neighborhood, this park is in town in an established neighborhood. $9 breakfast served daily. Good size pool which we did not use but looked clean. Large playground also. Nice grassy area with a swing and barbeque grill out the door of the MH. Railroad train noise every few hours. We camped at Greybull KOA in a Motorhome. Probably the best KOA we've experienced. 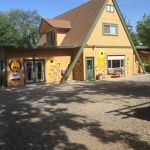 All level, concrete site pads, lots of pull throughs; concrete patios (some with grills and/or fire rings; friendly and experienced staff and owners; great wi-fi and cable (60 channels including ESPN & ESPN2); many of the sites are satellite friendly. We camped at Greybull KOA in a Motorhome. Owners were nice, had trouble initially because my husband is so stubborn, he wanted to park the trailer a certain way. She didn't agree and proceeded to comment about how long we have owned the trailer and that he didn't know how to back in. Which we are new to this. But ultimately he didn't want to back in because he wanted our door to face a certain way and our trailer is small enough that we can set it down and move it around by hand to where we want it. I felt a little insulted. But the campground was very clean, washrooms were spotless, laundry worked well. Campsite was a cement pad and was level. Grass is sparse, mostly gravel including dog park. other than the initial issues with owners both were friendly. Also offered advice on things to do. I would recommend. We camped at Greybull KOA in a Travel Trailer. This has been a must stop RV park for us for 10 years now. Our first time here was before the current owners and during every stop since then we have seen constant improvements. This is a small park and the owners are very "hands on" and it shows. I don't know what else they can do to improve this park. As usual, we had a pull-through, full hookup site on a cement pad with a cement patio and wrought iron furniture. All sites have 60+ channel cable TV. They give you a remote, you set your TV to cable and channel 3, and scan for the channels. Because the park has lots of fairly mature trees, there may be only a couple sites that are satellite friendly. The free Wi-Fi is for e-mail and surfing only. For anything that demands more bandwidth, you can pay for the advanced service. Of the 33 "regular" RV sites, about 10 are pull-through and the rest are back-in or pull-in. There are also 7 long term sites, 9 tent sites, and 3 cabins at the north end of the park. Finally, there are a few deluxe cabins - two behind the office and one at the south end of the park. There is a nice size, heated pool, a playground, a fenced pet area, etc. The building contains the office, a store, older, but very clean men's and women's bathrooms and showers, and an 8 machine ($2 per) laundry. They used to have a small cafe but always had trouble keeping it staffed (very small available work pool here). They still fix and cook 18" pizzas. I saw recycling cans for at least plastic, glass, and aluminum. Because they are a bit older than me, I wonder how much longer these two wonderful people will be able to keep this great park going. We camped at Greybull KOA in a Motorhome. The KOA in Greybull was a gem in the wilderness. The owners and operators are a couple from Amsterdam. They are two very hard working people. The campground was well maintained, the owners were friendly, the breakfast they served every day was great. (not free). Another thing that impressed us were the brochures they had produced to show visitors what there was to see around Greybull, of which there is a lot. The owners made the brochures themselves. We stayed 4 days, and plan to return. If you like exploring back roads, some unpaved, there are some amazing drives. We camped at Greybull KOA in a Motorhome. * The Devil's Kitchen, with "painted desert" type landscapes. A site with fossilized dinosaur tracks. * The Bighorn Mountains/Granite Pass, where we saw deer and moose. * Wild Horses in the BLM Wild Horse Refuge. * The Ariel Firefighter Museum (free, on the outskirts of Greybull). * Medicine Wheel (Historical Native American Archeological site @ 10,000 feet). This is one of the better RV Parks we have stayed in. The staff is very friendly, there are concrete slabs, and trees are each campsite. Trash cans are provided and emptied by park employees. There is an on-site restaurant, recycling bins, etc. This RV Park is about the only thing that Greybull, Wyoming has going for it as there is nothing else... We camped at Greybull KOA in a Fifth Wheel. There isn't even a fast food restaurant in Greybull, Wyoming. We spent several nights here while exploring the general area, staying in one of 2 deluxe patio pullthru sites. Lots of space in our "front yard", and a delightful bench swing to boot. Good points: friendly, helpful owners; very clean facilities; good sightseeing info that the owners have put together; easy to find. Not so good: though it worked out fine, front row pullthru sites lead directly on to a city street, with only a chain (& no lock) in front. Easy enough to get out of, though could be a bit tight for longer rigs, but it didn't feel as secure as most campgrounds do. I guess Greybull isn't a high crime district. RR noise evident, from several blocks away, but road noise definitely not a problem. Good base camp for the Bighorn basin, and looked quite a bit better than the other campground here. We camped at Greybull KOA in a Travel Trailer. Campground owner has put together a number of sightseeing flyers, each focusing on different interests - outdoor activities, scenery, wild horses, etc. These are quite helpful, and available to campers free of charge. Lisa's restaurant, down the street, is popular and has excellent burgers. Avoid lunch there - we saw bus groups stopping there midday. Excellent! Concrete level pads with nice patio, super nice showers. Great people with great service. Full breakfast was worth the extra charge. Would definitely stay again. We camped at Greybull KOA in a Motorhome. On day trips over the four days we stayed, we saw: * The Devil's Kitchen, with "painted desert" type landscapes. A site with fossilized dinosaur tracks. * The Bighorn Mountains/Granite Pass, where we saw deer and moose. * Shell Falls (waterfall). * Wild Horses in the BLM Wild Horse Refuge. * The Ariel Firefighter Museum (free, on the outskirts of Greybull). * Medicine Wheel (Historical Native American Archeological site @ 10,000 feet). 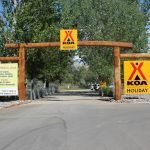 Are you affiliated with Greybull KOA ?